If you are looking for a used Chrysler 200 in Windsor, Chatham and surrounding area, the AutoMAXX sales team will be able to satisfy your needs. AutoMAXX always has a great selection of pre-owned Chrysler 200 in stock and add to the vehicle inventory daily. At AutoMAXX we proudly sell and service used Chrysler 200 to customers from Windsor, Chatham, Essex, Tecumseh, Tilbury, Leamington, Lakeshore, Merlin, Kingsville and LaSalle. The front-wheel drive 200 is offered in sedan and convertible body styles, as well as four trim levels - LX (sedan only), Touring, Limited and S. Two engines supply power: a 173-hp 2.4-liter four-cylinder and a 283-hp 3.6-liter Pentastar V6 with flex-fuel capability, mated to either a four-speed automatic or a six-speed automatic with manual shift mode. Building on the value-packed LX trim, the Touring adds aluminum wheels, an 8-way power driver's seat, automatic climate control, satellite radio and a garage door opener. The Limited trim is further equipped with fog lights, 18-inch polished aluminum wheels, heated front seats and leather upholstery, as well as a multimedia centre with 30 gigabytes of internal memory, USB port, Bluetooth streaming audio and DVD video capability. The S trim gets exclusive chromed exhaust finishers and wheel treatment, along with upgraded audio. Safety features include stability and traction control systems, anti-lock brakes with brake assist, active front head restraints, six airbags, tire pressure monitoring and a security system. 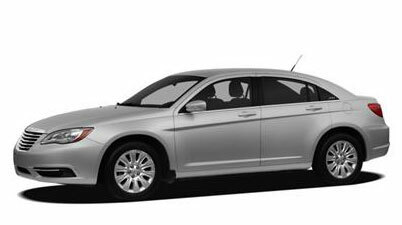 After substantial revisions last year, the Chrysler 200 carries over unchanged for 2012. Source Chrome Data. We were genuinely surprised and pleased at the advancements made in the transition from Sebring to 200. It's prettier by far, the interior is more modern and the materials more luxurious, the cabin is quieter, the engine performance in the V6 is excellent, and the crisp, sharp handling was the biggest and most pleasant surprise of all, although a highway mileage rating of 29 mpg was a nice surprise, too. Jim McCraw filed this report to NewCarTestDrive.com after his test drive of the Chrysler 200 around Napa Valley, California. Source Chrome Data.